October is here, the kids are back in school, and fall is in full swing. It’s time to focus on your goals and building your business. That’s why we are announcing a Double Business Builder Bonus! 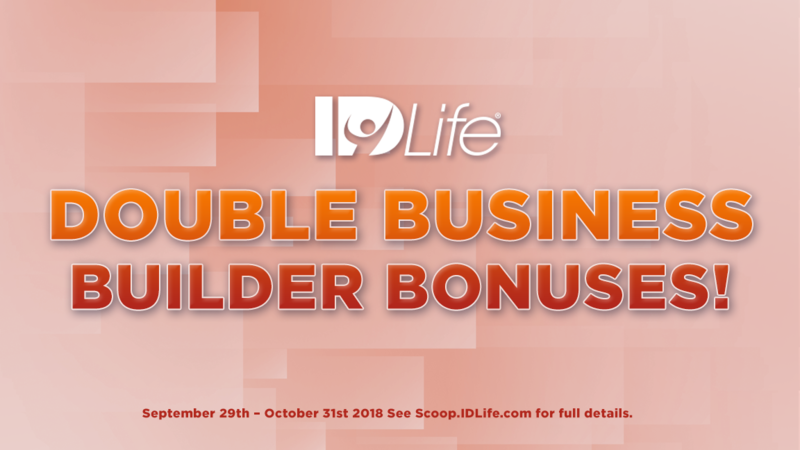 A Double Business Builder Bonus is paid to the Enroller when a new Associate who joins September 29th – October 31st, 2018 completes their Fast Start Bonus. Enrolling Associates who have an enrollment date prior to September 29th must qualify with 1000 PCV for the month of September or October (individually, not combined). All new Associates who join September 29th – October 31st will have 30 days from their date of enrollment or until October 31st, whichever is later, to earn Double Business Builder Bonuses when their newly enrolled Associate completes their Fast Start Bonus. All Double Business Builder Bonuses will be paid the month following the completion date of the newly Enrolled Associate’s Fast Start Bonus, after a full review and audit. Work must be performed to earn a Double Business Builder Bonus. This promotion is intended to promote business growth. All bonus earning activity is monitored by IDLife Corporate. Any Associate caught gaming the system will be reviewed, and any bonuses earned as a result will be deducted.